At the Candlelight Inn, we specialize in creating memories. Here you’ll find elegant Victorian accommodations, culinary delights and peaceful surroundings that set the stage for a relaxing getaway less than one hour from the Twin Cities and Rochester, Minnesota. This 142-year-old home was originally built by the manager of the Red Wing Stoneware Company, and like a fine piece of pottery, the Candlelight was artfully crafted with supreme attention to detail. 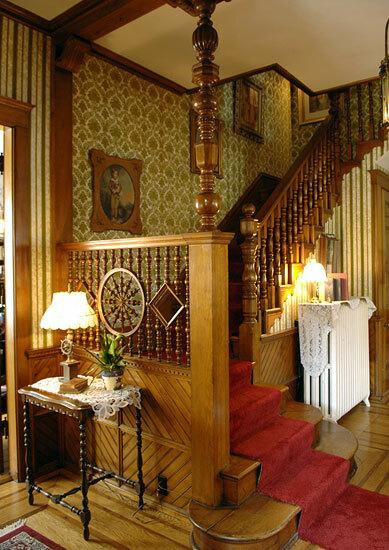 Because the home has been so well-maintained over the decades, many original features are still present today. Exquisite stained-glass windows; intricate butternut woodwork on the staircase, library and front hall; and Quezal light fixtures are just a few original details that make the Candlelight such a special destination. The master craftsmanship apparent in the bed and breakfast is complemented by modern amenities that ensure a comfortable and fulfilling stay. Each room features a private bathroom, fireplace and luxurious bedding, while most rooms also offer whirlpool baths. Look to the Candlelight for your next romantic getaway, and we promise to make it a special event.